and lots of mood in this picture. We are crossing the “Serena Pomp” valley. My eyes are tired from being on the lookout for an interesting scenery all day. It is my favorite area of this trip. The past three weeks it always felt like a special and magical territory. Hills on the left are the habitat of a leopard with one cub and on the right of the valley lives a lioness with three cubs on some rock formations. In between nests a family of vultures high up on tree. Believe it or not, although it sounds like a lucky and easy spot to take photos, I could not get one great shot of either of them. So all my hope was with today. We are approaching the valley. The already colder airflow brushes my skin and I roll down my sleeves while I hold the camera safely with the other hand while the car bumps over the uneven terrain. It is early evening but you cannot see the sun setting due to the cloud cover. Before we head downhill, I discover a group of giraffes strutting through the valley. I tell my guide to slow down the car and approach carefully. The giraffes group close together making a beautiful sight and I do not want to disturb them. We closed in I take a couple of shots. 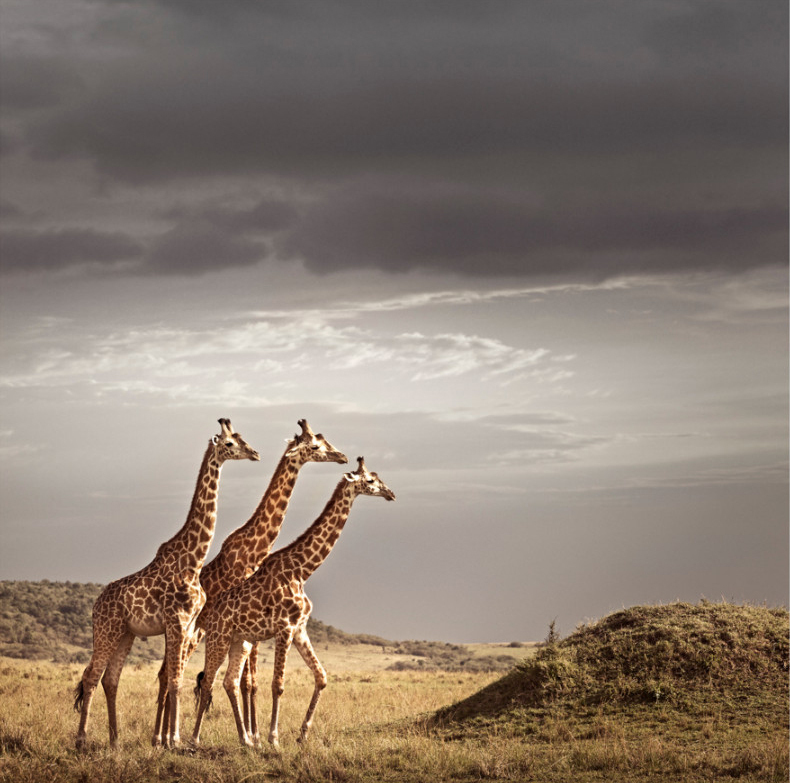 Then the sun lowers and the giraffes patterns gleam and stand out, I feel this is the right moment. I press the shutter a few more times knowing I captured a truly majestic moment.